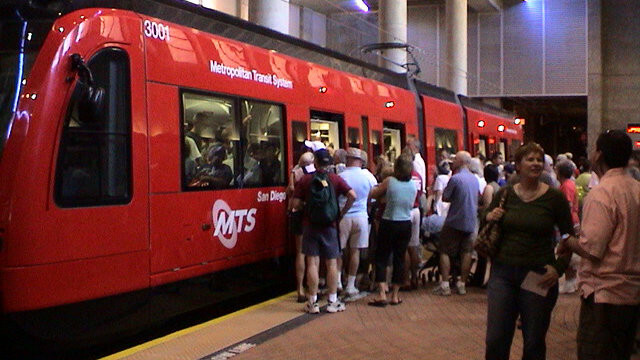 The legendary Irish rock band U2 is performing Friday at San Diego County Credit Union Stadium and the Metropolitan Transit System is increasing trolley service to accommodate the large crowds. In June, the superband announced a San Diego date to its tour marking the 30th anniversary release of “The Joshua Tree.” The album is one of the world’s best-selling with over 25 million copies sold. Although some tickets for the San Diego concert are still available as of Thursday afternoon, the stadium is nearly sold out for the 7:30 p.m. event. According to MTS, it is increasing its Green Line train service that will drop fans at the stadium. Trains will depart most Green Line stations every 15 minutes throughout the day and extra train service will operate from 5-9 p.m. between Old Town and the stadium. After the concert, which is expected to end around 11 p.m., extra trains on the Green Line will serve the stadium until crowds diminish, according to MTS. The last trains leaving the stadium are at 12:22 a.m. (toward Santee) and 12:38 a.m. (toward downtown). To speed up boarding and add convenience, MTS recommends that trolley riders use the mobile ticketing app Compass Cloud. As a bonus, Compass Cloud users can bypass the trolley line after the concert through the Compass Cloud express lane on the west side of the trolley station ramp.